The Air Ambulance Service (TAAS) fly critically ill people to and from hospitals right across Derbyshire, Leicestershire, Northamptonshire, Rutland and Warwickshire. They also operate the national Children’s Air Ambulance (CAA), transferring seriously ill children between hospitals, accompanied by specialist paediatric support. All of this is done without government support. At the heart of their mission is a desire to save lives, wherever and whenever possible. To do this, they need public donations. Ultimate were tasked with making that crucial donation process as easy as possible through usability testing. With the Children’s Air Ambulance gearing up to launch its powerful new campaign ‘Their Lives Above All’, it was vital that the donation flow was as user-friendly as possible. After all, there’s little point in encouraging people to make their donation online if the process is time-consuming, frustrating and leads to people not completing their transaction! This is where usability testing comes into its own. We were set the challenge of examining the donation flows and calls-to-action on both the TAAS and CAA websites, through user testing, analysis and insight, and feeding back recommendations. Given the nature of user experience, these tweaks and changes needn’t be earth-shattering. Often, making the smallest change can have a massive impact on a website’s usability and the audience’s impression of the brand. As user experience (UX) accredited designers, we are perfectly placed to make these calls. So, what is UX? Simply put, UX is how an individual feels when using a product or service, in this case, a section of a charity website. It’s about how enjoyable and straightforward they find the experience, and if not, why? Where does the frustration begin to creep in and what factors cause people to abandon the donation altogether? By using a variety of usability techniques, including website analytics, heatmaps and video recordings, we can pinpoint those pain points and make qualified improvements. Early research indicated that mobile users were much more likely to complete their donation than desktop users. Only 14% of mobile users successfully completed the donation form in comparison to 65% of desktop users. Why was this happening? This was clearly an area which needed some keen attention. TAAS and CAA each have their own individual website. Any recommendations needed to be applied to both with equal success. With such a massive difference in mobile and desktop donation completion rates, we needed to find a fix that would close the gap. With ‘Their Lives Above All’ campaign soon to go live, it was critical that the donation flow was optimised in time. We wanted to maximise their chances of donations at a critical time for the whole charity. Usability testing isn’t one simple test or session. It uses a whole range of techniques and methods. For TAAS, we primarily used a combination of recorded user journey testing and website analytics, the results of which were then analysed together. As a team, we observed twenty different people interacting with the TAAS/CAA websites. Given that TAAS is a public facing charity with an incredibly diverse audience, we actively tried to reflect that within our own choice of participants. Prior to the actual recording, we devised a set list of questions that each participant would be asked as they tried to complete the task. These questions specifically look at goals, behaviour, pain points and mental models. Goals- what are we asking them to do? What task do they need to complete? Behaviour- how did the website make them feel when using it? Were they frustrated, surprised or comfortable? Pain points- where did they begin to struggle or run into difficulties? Mental models- when working through the task, what were they expecting to see next on the site? Did this match up to reality? If not, how did that make them feel? By understanding why and where people expect to see certain things on a site and how they react when those expectations are not met, we can achieve a far better understanding of why people begin to feel frustrated. The task we set our users was simple: donate. Some users did so on desktop and others on mobile. We left it to each individual to decide whether to make a one-off donation or arrange a direct debit, a decision that was very telling in itself. As part of our testing, we used audio, video and screen recordings to capture their thoughts, facial expressions and on-site actions. Often, a furrowing of the brow can be very telling! We watched all the recordings together as a group in order to ensure that no little detail was missed. In addition to user testing 20 individuals, we also cross-checked our observations against the patterns found within our website analytics. As a full service integrated agency, we were able to draw upon the proven expertise of our digital marketing team. One website analytic tool that proved particularly helpful was heat mapping. By installing heat mapping technology on the TAAS and CAA sites, we could observe where users typically click over a given period of time. In the resulting coloured data, the most clicked data is displayed as red. Our heat mapping revealed that people were far more likely to click the donate button in the upper right hand corner of the site than the one embedded within a central header image. This observation was supported by our recorded user testing. With all this supportive information in hand, we set about evaluating the user testing recordings. A representative of each department took part in this evaluation: Account Management, Digital Marketing, Design and Development. Each representative brings their own expertise, priorities and strengths to the table whilst considering the client’s goals and objectives. As we watched all the recordings, we noted our observations for later discussion. Our next step was to score each issue in accordance with two criteria. What impact would us fixing this issue have on the end user, i.e. will it improve the user experience? How feasible is the solution from a design and web development perspective? All our scoring was shared in full with TAAS but to add further clarity, we also chose to present our findings in the form of a prioritisation matrix. Simply put, this graph highlighted which areas to prioritise in the short term and which fixes could potentially wait. Before going ahead with any solutions, we talked the client through every single score, explaining our reasoning and evidence as we went. The feedback we received was incredibly positive and TAAS were keen for us to carry out our recommendations as soon as possible. 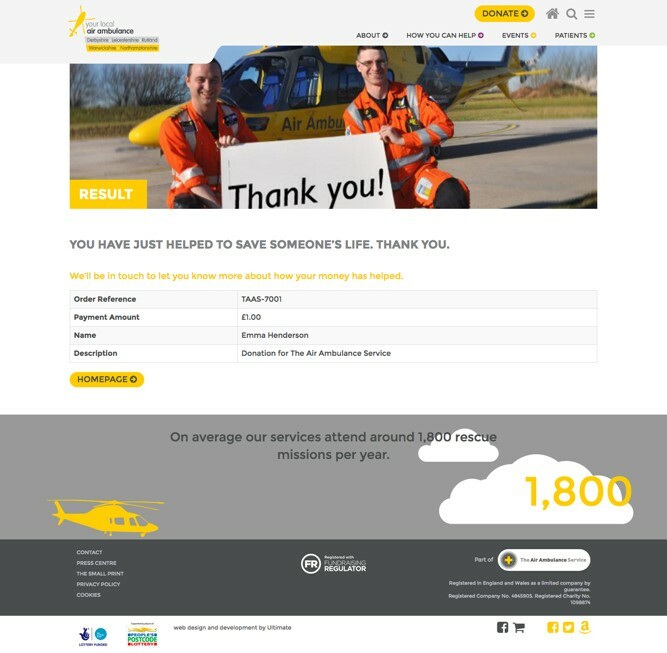 With the Their Lives Above All campaign launch a significant moment for Children’s Air Ambulance, it was crucial that the online donation flows provided the best user experience possible. We were expecting a significant influx of donations and didn’t want the technology to let us down and become a source of frustration. Thanks to their thorough usability testing, Ultimate put us in a great position at the best possible time – and we’ve seen a significant boost to digital income not just with CAA but also for our services, which is a tremendous result for a charity where every donation we get counts. In February alone, TAAS has seen a near 10% increase in traffic to the site, year on year. Within that, organic search is up by over 20%. This dramatic increase in traffic has clearly translated into a greater number of donations with all online transaction up by a remarkable 57%. Transactions from organic search have risen by almost 50% and have boosted revenue by 53%. Overall, online revenue has increased by an incredible 73%.